This rare manuscript edition sold out 1000 copies in the first year of publication (1963). Some of its poems have been quoted verbatim by world leaders and talk show hosts without knowing or naming their source. Its title work, in a section subtitled "In a Prehistoric Zoo," which articulated an atheist view of Creation and a humanist concept of "God", began the Pterodactyl fascination which recently culminated in the science fiction film, Jurassic Park, and is by now cliche. A revised edition, in multimedia format, is awaiting publication. That site, also under construction, is titled: PteroDARKtyl and follows in outline below. The text and layouts of the new revised multimedia edition are in the process of being archived. To browse, press each link then return to this page for the next one. (c) 1963, 1964, 1965, 2003 by ArtemisSmith. All Rights Reserved. The Author seeks a Producer for the next stage presentation of this multimedia work. Please telephone ArtemisSmith at 1-631-725-1414. 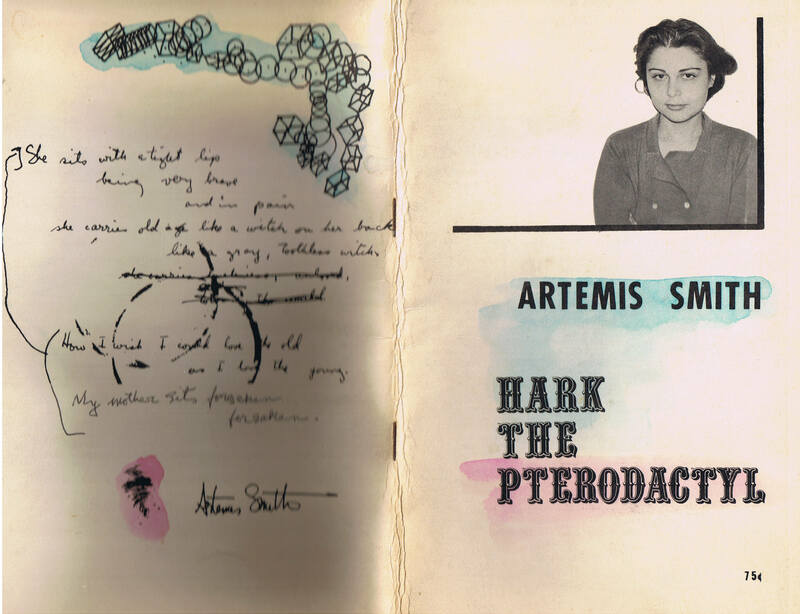 AUTHOR'S PRODUCTION NOTES: This Suite is a revised and rearranged selection from what was published in my manuscript edition, "Hark the Pterodactyl," (c) 1963. Parts of it, with additional lyrics, were first performed in 1964 at The Community Church of New York on Park Avenue as part of a Holiday Pageant meant also to include atheists and agnostics. Later, other parts were performed at Carnegie Recital Hall in 1965 simultaneously with my one-artist-show of graphic layouts at Center Art Gallery, East 57th Street, New York City. The musical presentation, sung by me and then orchestrated and embelished by Joseph Dylewski, was performed under his direction by a quintette composed of faculty from Julliard and Manhattan School of Music. The soprano soloist was Lette Rehnolds of Lawrence Welke's broadcast ensemble. Its last notable performance was at Edinburgh University, Scotland, during the 1973 International Festival, under the Computer Arts segment titled Interact. The work has always been merely a layout for a much more ambitious envisioned production - to become the first virtual reality interactive symphonic choral-ballet opera once the technology makes such an art form truly possible in all its white noise splendor. Although we are closer to that goal today, the visual aspects still fall short due to the failure of computer graphics to match the spontaneity of freehand brushstrokes and sculptured subtleties of plastic media. It is a work constantly meant to be recreated by each participant in a virtual reality performance. The more participants interacting, the better - especially if all or most of them are either accomplished artists or aspiring sixth-graders. Concurrently with the publication of my manuscript edition, my creative lifepartner, Billie Taulman, began her own composition around the same theme while long-term hospitalized for what was surely misdiagnosed as schizophrenia. Her manuscript and layouts, in active dialogue with mine, will also be published at her website as soon as time permits. That so many artists have become involved in this is just as it should be, for the work celebrates the interconnectedness of all creative speech, its continuous presence in the whole of human consciousness. In poetry, we all think and speak as One-and-Many. Wherefore, link here, Interact, and Enjoy!